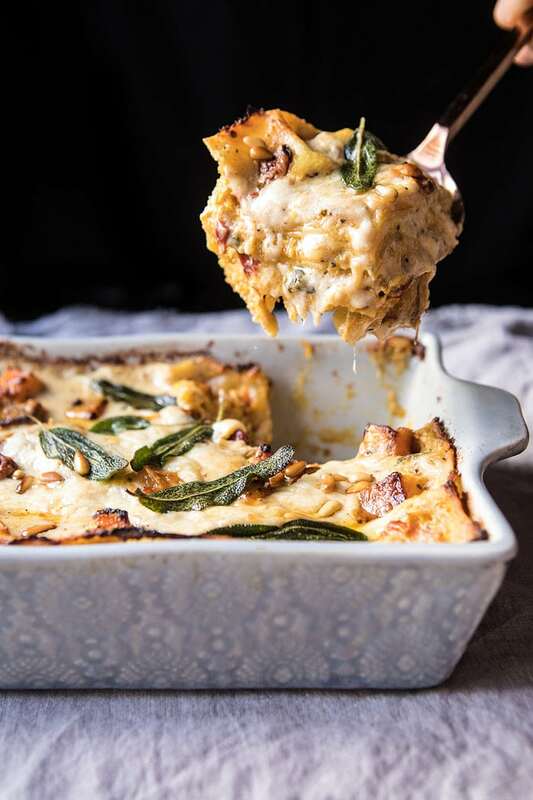 Wednesday just got a lot more exciting, and it’s all thanks to this Butternut Squash and Sun-Dried Tomato White Lasagna. It’s about that time of year when lasagna becomes a staple dinner around here. Every November (and December too) it seems I make a lasagna practically every week, or at least every other week. 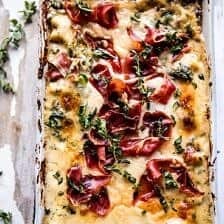 I have two that are in my rotation, and I know each recipe by heart, this classic lasagna (old recipe, but one I love so much) and this crispy prosciutto white lasagna. The first is an extra meaty and very classic Italian style lasagna. It’s hands down my brother’s favorite, but they love anything extra meaty (typical). 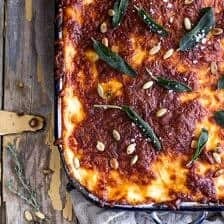 I make this classic style lasagna whenever the boys are in town and their friends are over, or for one of the nights when everyone is home for Christmas. It’s always a hit. The second recipe is a white lasagna that’s a knock off of my Aunt Katie’s recipe she used to make for family parties. I swapped out the chicken and added prosciutto for a salty factor and it is delicious. Depending on how many I need to serve, I often make this in addition to the classic lasagna…for those that maybe don’t love meat quite as much as the boys. Here’s the thing, I realized when I was planning out this year’s Thanksgiving menu that I really needed a good vegetarian option on the table too. I know turkey is supposed to be the star, but these days there are so many people who appreciate a good veggie friendly recipe. 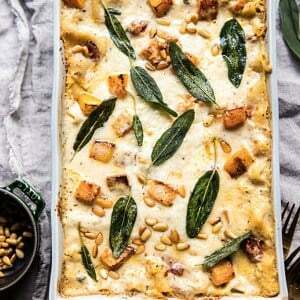 Enter in this butternut squash lasagna. It’s no secret that I love butternut squash. I’ve shared a handful of new recipes this season alone, but I think this lasagna is probably my favorite. 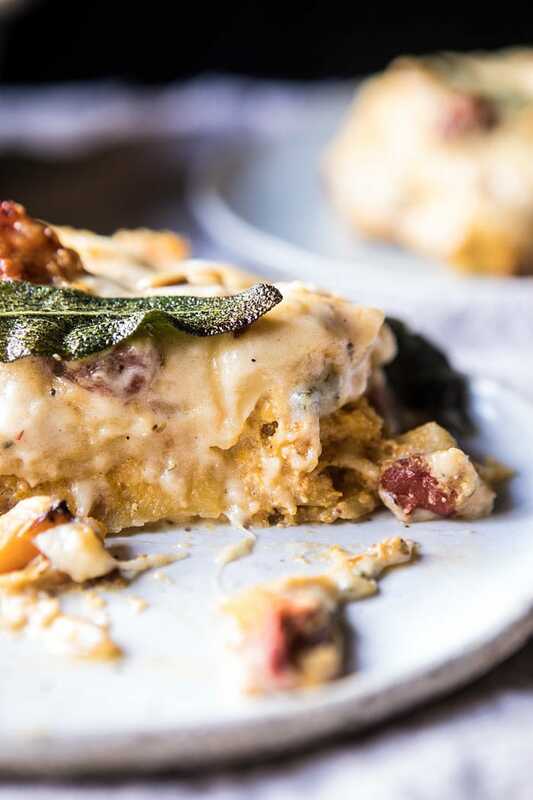 There are layers and layers of cheesy, butternut squash goodness, and I’m not sure it gets better when it comes to a white lasagna. 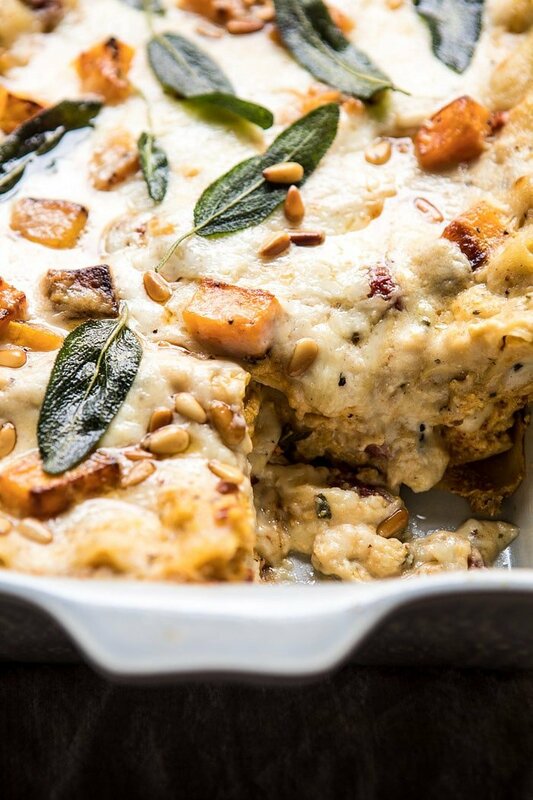 Trust me, if you have some vegetarians at this year’s Thanksgiving (or any other party), make this lasagna. It’s sure to win over just about everyone. 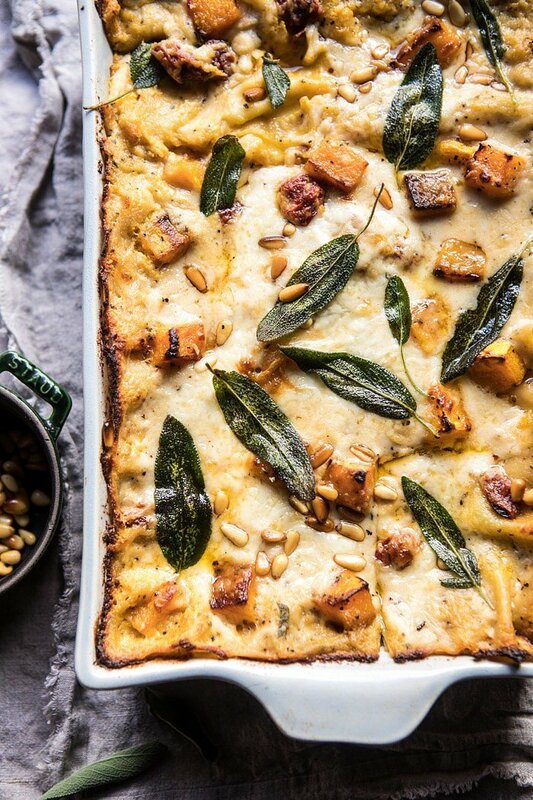 The base of the lasagna is made of up of roasted butternut squash and ricotta cheese. I added in sun-dried tomatoes, one, because I love them, and two, because I think they add such a delicious sweet flavor, plus a nice pop of pretty red color too. 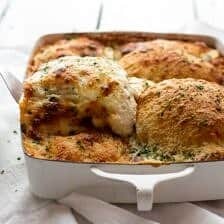 What’s great about this recipe is that it’s a dish that can be assembled completely in advance and then baked just before serving. I love making this the day before, keeping it in the fridge, and then just throwing it in the oven before dinner. It makes for easy, stress free entertaining. Plus, it’s just so good. I mean, when you have four cheeses, roasted squash, sun-dried, tomatoes, and pasta involved…of course it’s going to be good! And even if you don’t need a vegetarian recipe on your Thanksgiving table this year, this dish works equally well dressed up as a fun dinner party main course, or served casually at the family dinner table. I’m sure I will be making this recipe many times over the next couple months. Some of my brothers will be arriving in a week or so (Red and Kai are currently in Italy for some snowboarding, filming, and a Big Air contest in Milan) and with them comes all the friends…meaning big eaters. Now, if only we’d get the snow all those snowboarders need. I’m pretty sure it’s coming though. Also, this would of course make for a pretty cozy Wednesday night dinner too. I know it’s a bit more work for your typical weeknight dinner recipe, but some weeks just call for an extra cozy dinner mid-week. 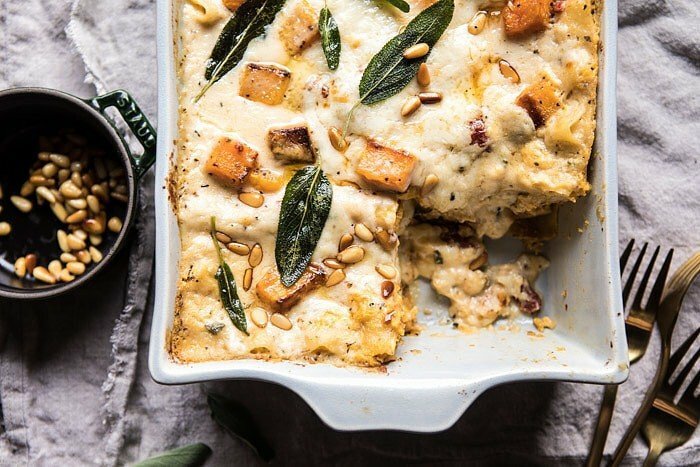 A vegetarian white lasagna with roasted butternut squash and ricotta cheese, sun-dried tomatoes, and a creamy Béchamel sauce. 1. Preheat oven to 375 degrees F. Grease a 9x13 inch pan. 2. On a baking sheet, toss together the butternut squash, olive oil, honey, and a pinch each of salt and pepper. Transfer to the oven and roast for 25-30 minutes or until the squash is tender. 3. Melt the butter in a medium sauce pan. Add the garlic, sage, and basil and cook 30 seconds or until fragrant. Whisk in the flour and cook for about 1 minute. Slowly add the milk. Stir in the nutmeg and season with salt and pepper. Bring to a boil and stir for 1 minute. Remove from heat and stir in the fontina cheese and 1/2 cup of parmesan cheese. Stir until the cheese is fully melted and the sauce is smooth. Set the cheese sauce aside. 4. In a medium bowl, mash the roasted butternut squash until mostly smooth. Stir in the ricotta, provolone, and sun-dried tomatoes. 5. Spread 1/4 of the cheese sauce in the bottom of the prepared baking dish. Top with 3-4 lasagna sheets. Spread with 1/2 the butternut squash mixture and then another 1/4 of the cheese sauce. Place another 3-4 lasagna noodles on top, and then top with the remaining butternut squash mixture and another 1/4 of the cheese sauce. Add the remaining lasagna noodles and pour the remaining 1/4 of the cheese sauce over top. Top with the remaining 1/2 cup of parmesan cheese. Bake uncovered for 45 minutes or until the top has bubbled up and browned a bit. Let stand 10 minutes before serving. Top with pine nuts and fried sage. Plus, lasagna is always a good idea…always. This lasagna sounds very interesting, I’m really wanting to give it a go. Haha I totally would if I could! You should totally make this though, Liz, I think you will love it! I have been waiting for this recipe since you posted about your Thanksgiving table a few days ago. Looks great! Which brand of no cook lasagna noodles do you use? Wow! What amazing recipe, I definitely love lasagna and dried tomatoes. Great! I hope you love this lasagna Daniella! Thank you! Hi! Is there anything that you would recommend to substitute the sun dried tomatoes? This recipe looks AMAZING to me and I’d like to try it, however, super not a fan of sun dried tomatoes. Thanks in advance!!! Sounds great! I hope you love this + let me know how it turns out! Thank you! why, oh why does my husband not eat cheese????!!!!! This would be so stunning. I may have to make a half recipe and eat it all myself! Come to think of it… that’s actually a better idea than trying to get him to eat cheese! Haha yes sounds like a great plan! I hope you love this Debs! This looks delicious! 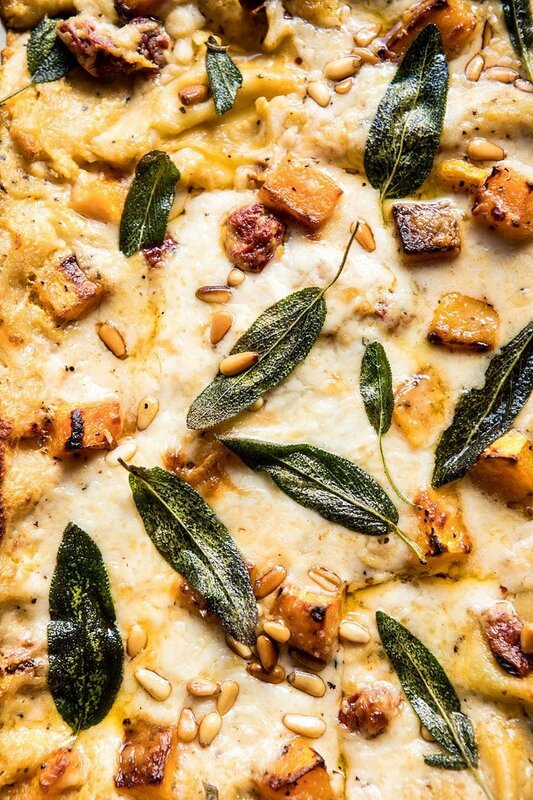 Gimme alllllll the butternut squash everything! We made your Pappardelle with the butternut squash and tomato ragu a few days ago and it’s one of my husband new favorites! We’ll have to try this ASAP! Side note, I never know what brand of wine/ beer to use in your recipes so if you have any favorites, I’d love to know. The red wine we used was awful haha and it still tasted amazing! That is so amazing Amy! I am so glad you and your husband loved this recipe!! Thank you! My vegetarian brother is coming home to New Zealand from England this Christmas and I am going to make this for him! Yum!!! Perfect! I hope he loved this Frances. Thank you! Thank you Caroline! I hope you love this! Looks amazing! Recipe says to mash the squash, but picture shows shows roasted cubes on top?!? 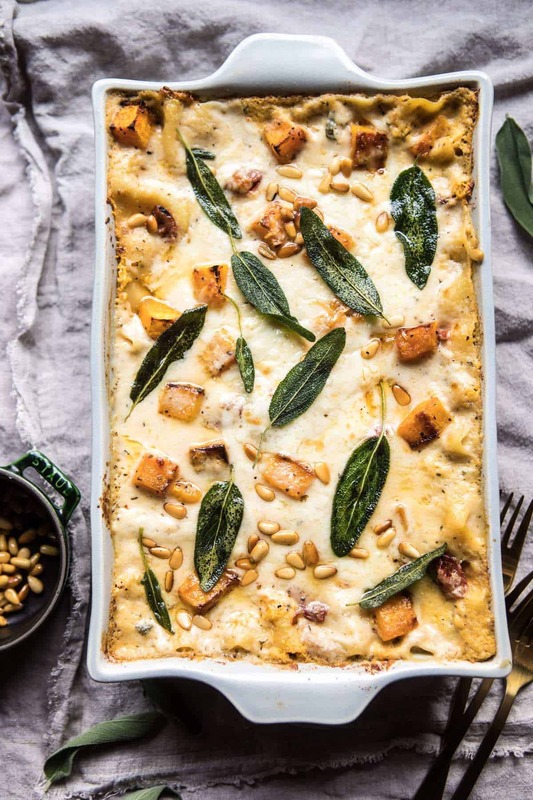 I love butternut squash with sage – this lasagna is my dream meal! I hope you love this! Thank you Laura! This recipe looks amazing! I have been making so many of your recipes for my BF and I and I want to try this one next, but the BF is very allergic to pine nuts. I know I can omit it, but you do you have suggestions for another topping that may be good in its place? Could I make this in the morning and then wait to bake later that evening? Made this for Friendsgiving on Saturday! It was delicious!! That is so great! I hope your friendsgiving was amazing Lindsay! Thank you! Oh my goodness! Made this last night exactly as stated. Wasn’t sure about the butternut squash/sun dried tomato combination, but it was amazing! Making this again for thanksgiving for the vegetarians! Thank you! That is so great! I am really glad you liked this and I hope it goes great at your Thanksgiving! I wonder if I could use a different pasta shape, cooked on the firmer side of al dente, and bake as a casserole? Hi Tieghan, I love your blog which I happily stumbled upon today! I wanted to draw your attention to your picture of the pan of roasted butternut squash… there is an unwanted guest laying across the left and top. Hi Sandy! So glad you found my blog. Thank you so much for catching that and letting me know! What about makinig this ahead? Would this work? And if so, Bake and preheat, or assemble and bake later? Thanks – looks fabulous! Can this be made in a crockpot? I’ve seen a few crockpot lasagna recipes recently but not sure if I’d have to roast the squash first. Thanks!! Can this be made and frozen in prep for Christmas? Do you think one could make this a day or two ahead and then bake it later? I’m not a novice cook and I also end up making a lot of things by looking at what I have or what is in the farmer’s market and think, “Okay, what can I throw together with this?” My husband will eat anything I make. My teenage son will eat about 90 percent of what I make – my rule is “you can’t tell me you don’t like it until you try it.” He was not a fan of this at all, but he was hungry, so he ate enough to not be hungry, but he didn’t eat a normal serving size for a 13 y/o boy. I was not a big fan of this, either, and I still have half a lasagna sitting in my fridge. My son loved the butternut squash recipe that Tieghan presented as a rigatoni pie with gorgonzola. That was his introduction to butternut squash. . .something he swore up and down that he hated. 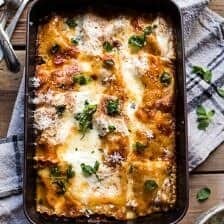 He loved that a few years ago, so I am always looking for new and fantastic ways to use butternut squash (other than the typical ravioli I make). I loved that butternut squash rigatoni pie and so did my husband, so when I’m feeling ambitious re: having to shove the rigatoni in the springform pan, I’ll make it. THAT is a fantastic butternut squash recipe. I will tell you that after I made the roux, I added the milk. We use almond milk so if anyone else does not use cow’s milk, almond milk does work as a good substitute. My issue was the fact that it makes SO MUCH cheese sauce. As an Italian-American, do I have a problem with cheese? No. No, I do not. I love cheesy goodness. But you could still make this recipe without making this much sauce. This was my first time using no-boil lasagna noodles. I know the concept is that the sauce cooks the noodles; however, for this recipe, there is just so much sauce that the noodles are certain to cook. I just don’t think you need that much because the recipe ends up drowning in the sauce. I kept adding sauce and then when I was ready to layer the last of the sauce on, I didn’t use all of it because it was just too much. It was just like, “holy heart attack” and that was without using the whole milk. I did add more garlic, some red onion, and a little more than a pinch of various spices to this. If you don’t, the cheese sauce will pretty much absorb the flavors you add and it will be kind of bland. I don’t think the blandness has anything to do with almond milk, because I have used it successfully in other recipes that require milk. I used the Italian herb style sundried tomatoes. They have a lot of flavor, so if you hit a patch of the tomatoes, it’ll give this some serious zing. Honestly, if I were to make this again, I would not make it as a lasagna. I would boil some manicotti or jumbo shells and stuff them with this filling, and then maybe cut the sauce down by about half. It already has a lot of ricotta and provolone in the butternut squash mixture, so if you wanted to cut down on some of the cheese, that would be a way to do it. Having put this together, I can say that it will hold up to adding other vegetables that complement butternut squash in that part of the mixture. It’s a good base recipe for the filling to play with. I can see putting the filling in raviolik too, instead of just the puree butternut squash mixture I end up making. Hi Dani! I am sorry you did not enjoy this recipe. Thank you for letting me know, I hope you enjoy some other recipes on my blog! OMG, this lasagna is so delicious!! We are a meat-eating family but we had some vegetarian friends over for dinner so I made this lasagna. It was so wonderful, so amazing, so yummy. Everyone just ate it up! The sun-dried tomato compliments the butternut squash so well. The fried basil, the roasted pine nuts. This recipe is a winner, and we’ll definitely be bringing it back. That is so great! I am really glad you and your friends loved this dish! Thank you! I don’t love squash…can I substitute sweet potatoes? Thx! I’m newly addicted to your blog after receiving your recipe for roasted sweet potatoes in my fall delivery from Domaine Chandon. I have already made the buffalo chicken corn chowder, the previously mentioned sweet potatoes, roasted greek chicken, and the crispy proscuitto lasagna – i mean everything is unbelievable. You are now my go to source when I have to cook anything! Everything has been so flavorful and delicious. I’m thinking of giving this recipe a try..but it’s hard to give up those crispy bits of proscuitto from the other recipe – do you think I could add that on to this recipe? Would the flavors go well together? You have really make cooking enjoyable again and its nice to see recipes with just good food – not pushing trends or same stale recipes. Wow! Thank you so much! I am thrilled you are enjoying my recipes so much. Makes my day!! That is so awesome! I am so glad you and your family liked this dish and I hope it turns out great for you on Christmas! Thank you Ashley! Made this about a month ago. This was sinfully delicious! Enjoying your recipes on the blog, so purchasing your cookbooks is a must! Lasagna is the perfect main when having friends over for dinner so I decided to make this to use up a butternut squash that had been sitting around. I made it a day ahead, which is one of the best parts of this recipe. I would never have thought to pair butternut squash and sundried tomatoes, but it totally works. I also added and egg to the squash-cheese mix to make sure it set. Overall, it was a nice change from the usual tomato-sausage lasagna but not difficult to make. I am really glad this turned out so well for you Rachel! Thank you! This looks amazing! If you did add a meat protein, what would you choose? If you were to make this ahead of time, how long before do you think you could make it and how would you store /reheat it? Fridge or freezer and bake ahead or no? Can’t stand ricotta! I usually do my normal lasagna with sour cream instead of ricotta. Do you think that would work okay in this recipe? Hiii!! Are the calories per serving or total??? Hi Brandi! It is per serving! I hope you love this! Would canned butternut squash work if you’re pressed for time? This looks delicious!! Do you have any suggestions to make this healthyish? Do you think a nut milk and less cheese would work? Thank you in advance! This looks amazing! I’m not the biggest fan of sundried tomatoes. Is there anything else you would suggest for a substitute? I definitely want to add prosciutto ! hi there, I am planning my shopping list for this recipe. But I noticed in another recipe you have listed 8 cups cubed butternut = 1 medium butternut. In this recipe 4 cups cubed butternut is (1 medium butternut)… in your experience which is more realistic? would you mind clarifying. Thanks! Just made this tonight for dinner and it was absolutely delicious! I followed the recipe… the only change was I subbed shredded mozzarella for the provolone. This will definitely be added to my rotation. Thanks for another great recipe! I made this tonight for dinner and it was delicious as beautiful! Butternut squash is one of my favorite things, and this did not disappoint. I stayed true to the recipe except for subbing mozzarella for the provolone. I will definitely be making this again. Thank you for another great recipe! That is so amazing! I am so glad you enjoy my recipes and posts! Thank you Genevieve! Hi! So just to confirm, there’s 3 layers of lasagna noodles, and the top layer is extra noodle-y? I just assembled it and am excited to serve it at my holiday party tomorrow!